When I was new to the Austin Seven world some 20 years ago, there was much talk of the problems from “fuel vaporisation”. I reasoned that if I fitted an electric fuel pump in SERIES with the existing mechanical pump, but remote from the engine compartment, where the fuel in the pipe would still be cool, then should I suffer the problem all I would need to do is switch the electric pump on which would pump cool fuel in the direction of the carburettor and purge the vapour lock from the system! We now have three cars modified in this way. However my reason for doing it has changed since I have only once used it for the purpose originally intended! By far the greatest benefit is the ease with which the carburettor can be primed when starting for the first time each day. Previously there were three options. Churn the engine over on the starter. No problem on 12 volt but a less than perfect 6 volt battery can give a few heart stopping moments! Crank the engine on the starting handle. Ok for the young and fit but for most of us less exciting. Open the bonnet, reach into the oily depths of the engine and manually operate the pump. Not difficult but can be messy and a bit of a chore. You now have a fourth option, reach over and switch your electric pump on for a few seconds. No contest! The following description tells you how I have done the modification, it’s not the only way but has worked for me. First a little bit of theory. The electric pump needs to be connected in SERIES with the existing mechanical pump. This is easily achieved by cutting the existing fuel line from the tank to the pump and reconnecting it through the new Electric pump. Then when you switch on the electric pump it PUSHES the fuel forward through the (stationary) mechanical pump up to the carburettor. When the engine is running, and the electric pump OFF, the mechanical pump PULLS the fuel through the electric pump and then pushes it up to the carburettor. Now for the practical bit but first a word of warning! SPILT FUEL and ELECTRICAL SPARKS can make a BIG BANG! Take great care to ensure the two never meet while you carry out the alterations and in any case have a fire extinguisher readily to hand. I have fitted SU Fuel pumps to all our cars because they are easy to mount, spares are readily available and most importantly I picked up the pumps at autojumbles for not a lot of pennies! The choice of what to use is yours, the method of fitting will be very similar. I have located the pump in the compartment under the passenger seat because the fuel pipe passes beneath it, the fuel is still cool at this point and it is readily accessible should it need any attention. The first job is to mount the pump in position. I have always fitted the pump near to the tunnel which helps the pipe runs and still leaves a useful storage area. The pump can either be bolted directly to the vertical cross member or bolted onto a bracket screwed to the floor. You will have to provide a switched, fused electrical supply, only live when the ignition is on, to power the pump. Where you position the switch is your choice but please don’t just drill a hole in the dash for it! You need to be more subtle! In one case I wired it through a redundant (original) dip switch on the steering column and another via a switch mounted through the cross member beneath the front edge of the passenger seat. The pump is connected to fuel line using genuine fuel hose (Halfords or a Motor Factor) clips and the appropriate unions on the pump. Drill two clearance holes in the floor pan, adjacent to the pump, to pass the new fuel pipes through. 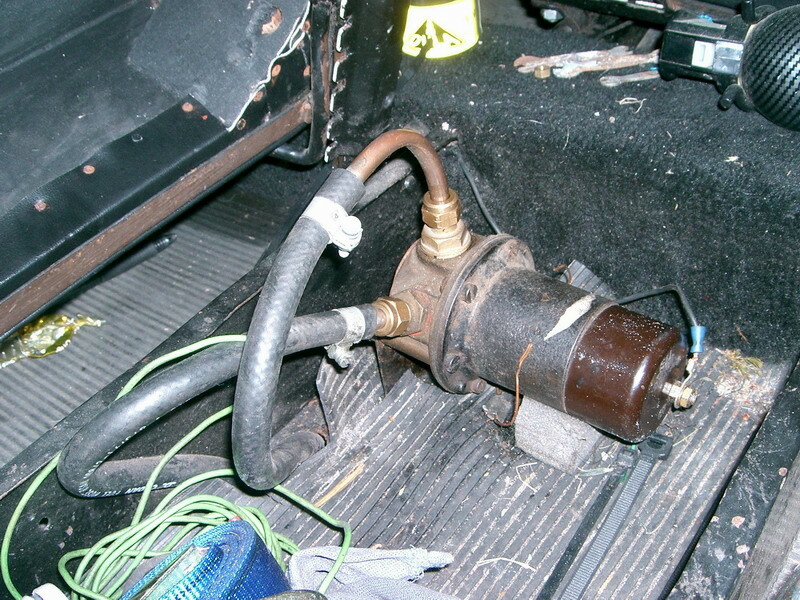 Locate the fuel line, on the inside edge of the chassis under the passenger seat. Using a hacksaw blade or similar cut the pipe. Mop up any spilt fuel and dispose of the soaked rags safely. Connect a length of new hose to each of the cut ends and secure with the correct clips. Pass up through the new holes in the floor and connect to the pump. Make sure that the pipes are connected correctly and securely. The new pipe that is connected to original pipe that returns to the petrol tank should go to the INLET on the electric pump. The pipe going to the original mechanical pump should be connected to the OUTLET on the new pump. Now the moment of truth! If you switch the electric pump on it will start ticking rapidly (in the case of an SU pump). As it starts to draw fuel through the ticking will slow down and finally stop when the carburettor is full. You can now switch off the electric pump, its job is done until the next time! IF the pump does not stop ticking then there is likely to be a leak, either sucking air in between the new pump and the tank or a fuel leak between the new pump and the carburettor. In any case check all the new connections for leaks. As a precaution I carry a coupling that allows me to join the new hoses, going to the electric pump, together should I need to isolate the pump. The same coupling also allows me to connect the fuel pipes on the mechanical pump together should the mechanical pump fail. In which case electric pump would be switched on continuously and take over the mechanical pumps job! In very cold condition it can be advantageous to turn the engine over on the “handle” to get the oil circulating before attempting to use the starter so don’t totally neglect the starting handle! This article, written by Andrew Jarmin, originally appeared in CA7C Seven Focus in March 2010 pp 19 - 21.